Q: Talk about Huntington’s disease and how it changed your life. Q: What is your association with HDSA’s Wisconsin Chapter? Shauna: We quickly because associated with HDSA and HDSA Wisconsin for resources and support on managing a family member with Huntington’s. In 2006 I joined the HDSA-Wisconsin Board to give back and was the president for many years. When my children were born, I stepped off of the board but continue to manage 6 events: The HDSA Re-Prom, The Midwest Log Rolling Championships, and our 4 Run/Walks across the state. Q: With the Madison Re-Prom coming up, can you explain the event and how long is has been going on? Shauna: At the 2010 HDSA National Convention, I began brainstorming this idea with some of my friends in the National Youth Alliance. In 2011, I got together an amazing group of women and we had our first “HDSA Wisconsin Re-Prom” that next year. Q: Since then, what have you seen from this event? 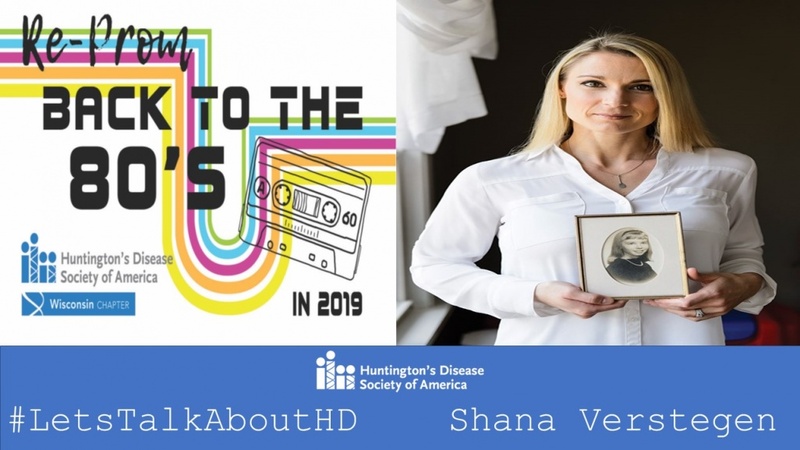 Shauna: Since then the event has been going strong with 200 - 300 attendees in attendance annually pulling in close to a half a million dollars for HDSA’s Wisconsin Chapter. We can celebrate those who we have lost, but also take a night to have FUN, and celebrate HOPE that this disease will one day be gone from our lives. The Madison Re-Prom Event: Back to the Eighties will take place on Saturday, March 2nd at 5:30 pm (CST) in the Madison Monona Terrace Community and Convention Center. For more information about the event, click here.